Priced at Rs 1,999, this starter kit from Jio contains software and hardware products worth Rs 10,884. Jio is a GSP or GST Suvidha Provider, and their newest launch is part of their initiatives to help small businesses. What Is Included Under JioGST Starter Kit? Jio is providing an app-based GST solution platform, which can help the SMEs to file tax returns under GST. This is compatible with any billing software, and can instantly make SMEs GST ready. In fact, there is no requirement for any additional billing software or even a computer. The price of this software is Rs 1999, which is being offered within this starter pack. The starter kit will have Jio billing application, which can generate summary wise invoices for the small business, which can be used for filing GST returns. Powered with tax codes for thousands of products and services, this billing application doesn’t require a printer to work with. With this, entire summary wise billing details can be extracted without using any computer. The actual price of this app is Rs 4999, which has been offered under this starter kit for free. And, this is an offer which makes the starter kit as indispensable part of any SME’s accounting process. 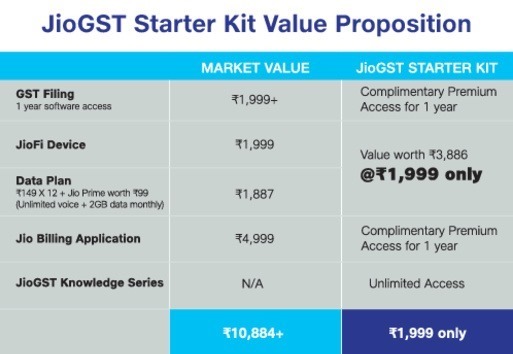 JioGST starter kit will include a JioFi WiFi device, which will provide unlimited voice calling and 24 GB of 4G data for a year. Besides offering door-step delivery and activation, Jio is also offering finance options and buyback offers. The starter kit will offer access to thousands of tax professionals and experts, who can help the SMEs to file GST returns. Besides, the business owner can authorise any tax professional to file returns on their behalf as well. And, Jio is offering access to a massive JioGST knowledge hub, which comprises of dedicated GST Chat channel on JioChat, access to professional tax experts via emails, regular seminars and events related to Jio and more. Retailers Association of India (RAI) has already partnered with Reliance Jio for availing services under JioGST starter pack for all merchants and traders under their association. You can buy the JioFi JioGST Starter Kit from here. "Reliance Jio Launches JioGST App; Offers JioFi & 12 Month Data Free! ", 5 out of 5 based on 21 ratings.